Comments: The remaining pages are available online. 56 pages of extras. Several one shot comics based in endgames or semireal life. An episode index. Ten page minicomic Grand Theft Colo. 9 character sketches. 9 page endgames comic. 5 sketches on the female characters in Megatokyo titled In search of lost wings (rather touching sketches). Summary: In this volume Yuki, the high school girl who found Piro's bookbag and sketchbook inside, has unintentionally discovered where Piro works. It just so happens to be at the place where she likes to shop once in a while 'Megagamers' where she likes to buy cd's. Yuki likes to buy manga too, but it seems that she does that at another store. She runs out of the store nervous and not knowing what to do. Does she return the book bag and sketchbook? Does she make the attempt to find out more about this mysterious artist whom she has been obsessing over yet knows nothing about? Yuki doesn't know. She doesn't know much of anything about what to do at all in fact. She doesn't know what to think about this mystery person or even if she likes him or not. All she knows is that her friends keep teasing her about him and she keeps feeling more and more nervous every time she thinks about him. She knows she has to decide to do something soon or else things will just keep getting worse for her. Meanwhile Erika invites, Kimiko, Largo and Piro go out to the local beer garden in order to get Piro and Kimiko over their continual and persistent awkwardness towards each other and off of Erika's nerves and also as a way to get Nanasawa Kimiko to start eating again. The night of drinking however does not go as well as planned. Kimiko and Piro get drunk and start to argue with each other. Kimiko gives Piro the rail card that she got from Piro in the first volume and accuses him of doing this all the time as a way to pick up girls at the station. Piro gets angry with her and slams his mug down when Kimiko hands the rail card back. He claims that he never did it to pick up girls at all. In the end Erika and Largo take their friends back home because they are a bit too drunk to walk on their own. The next day the two feel awful physically and also feel bad about how they treated each other the previous night. Hung over as he is Piro finds out from Erika that Kimiko is trying to become a voice actress adn get the part of Kotone in the game called 'Sight'. Piro then feels obligated to give Kimiko a sketch of his that he made of the character Kotone that she is attempting to get as a way of encouraging her despite how the previous night went. They end up making amends so to speak, but are still uncomfortable around each other, this time for different reasons than before. At least they are talking to each other a bit more in this volume. For Largo the battle has just begun. Miho is on the loose and she must be stopped. It is unclear who or what Miho is, but a few things are clear. She is a master at manipulation and she likes to play games. In fact most everything in life is a game, but it is always a game that she takes very seriously. To make matters worse Piro's conscience runs into an old adversary who is something less than helpful. Overall this series just gets better and better for me. The artwork is just incredible in this volume and if you go to the website you will see that the story and artwork just keep getting better. I for one am a loyal fan and want to promote his site and books as much as possible. The books are high quality and well worth buying even though they are available online. The books are worth buying and by doing so you will be able to read the books the way they were meant to be read and support the author. This manga comes very highly recommended. 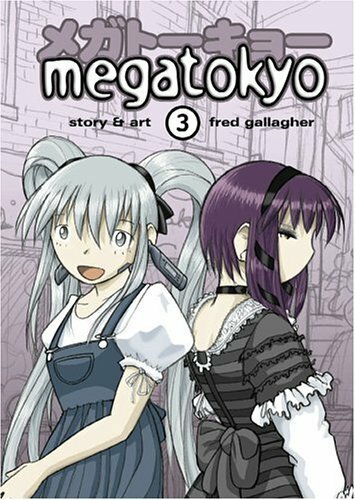 Where Found: mazon, Borders, local book stores, thinkgeek.com, megatokyo.com, etc.